The Finish-A-Long sponsored by Rhonda at Quilter in the Gap is never far from my mind. Which is good, as it keeps me going on wips in the midst of frequently finding new projects to start! This third round, I had 4 projects on my list. A year in the making was the 4x5 modern Quilt Bee quilt. I had blocks from 3 rounds of the bee, and just needed to pull them all together. 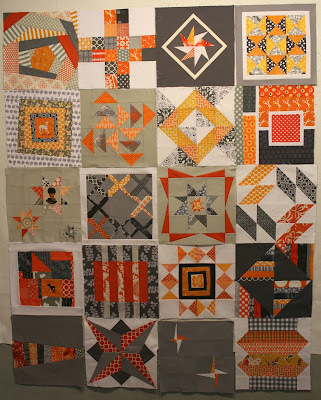 After much debate, I ended up framing all the blocks in Kona Tangerine, then finished with a border in Kona Charcoal. In the end, it was a pretty traditional finish for these modern blocks, now known as G.O. Modern. There's a pretty photo-heavy post here if you want to read more about this project, and a run-down of my adventure in quilting it here. Major accomplishment for me, this one. 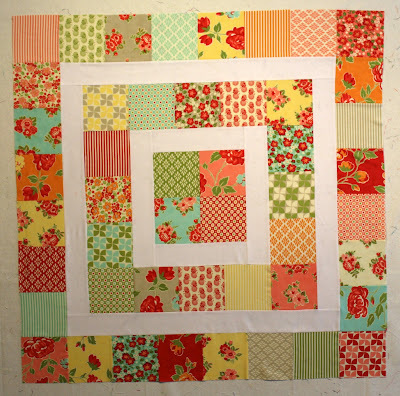 Marmalade "Storytime Squares" baby quilt was up next. I had the piecing of this baby quilt well under way. So A Taste of Marmalade was a pretty sweet finish. A QWERTY variation kind of loomed in the background for a while. This "re-do" of the original QWERTY was for my bookkeeper friend, who had given me a focus fabric to work with. 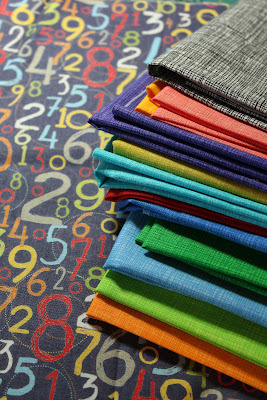 Once I actually faced this stack on my sewing table, Digits came together without much fuss. What I haven't gotten done is my Christmas lap quilt to coordinate with the non-traditional tree skirt I made last December. 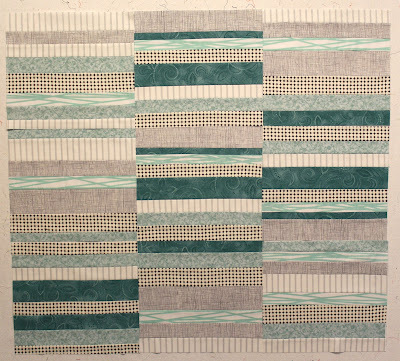 I do have some blocks pieced, and this one is definitely going right back on the list for the fourth quarter! Stay tuned - those greens and browns in the tree skirt photo will still be making an appearance! I'll be linking my finished projects up to the Finish-A-Long Third Quarter Linky Party! Also linking up with Let's Get Acquainted Monday Link Up. Great finishes this quarter - including the not-yet finish :) I missed out on your Christmas skirt but I really like it and think the quilt to go along will look great. I love the colorcombo of the G.O. Modern quilt! 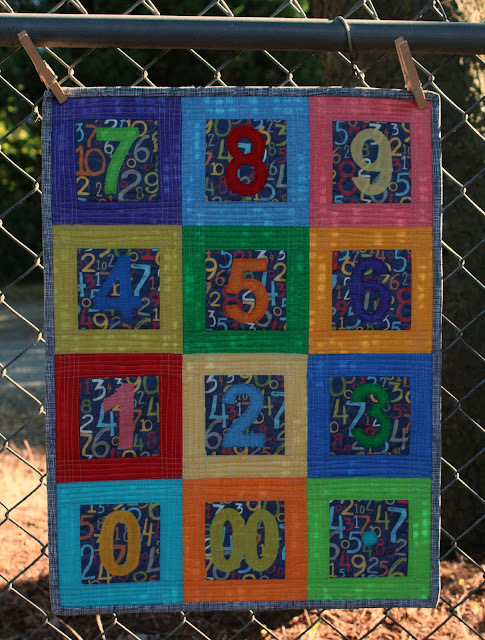 Your 4x5 quilt is amazing! I alos love your Christmas quilt - soooo pretty. Well done with all your finishes! Great finishes! Can't wait to see how the Christmas lap quilt turns out. Your quilts never bore, seeing them for a second or third time! Love the Qwerty quilt. Even better, that it is for a bookkeeper! 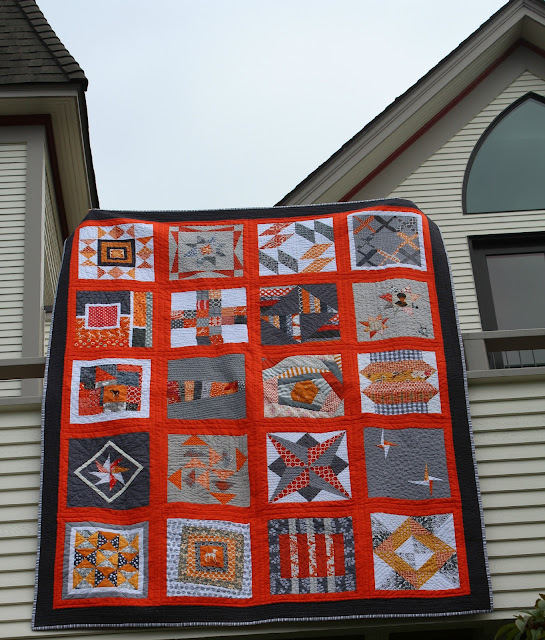 Wonderful job on the quilt framed in Kona Tangerine. Great job once again! The lap quilt so far, how big is that what you've pictured? It is so nice to see all these again, they are wonderful finishes. You had such a productive quarter! I love all your makes but the 4*5 modern bee quilt is my all time favourite! You have been busy. I particularly like the marmalade quilt. 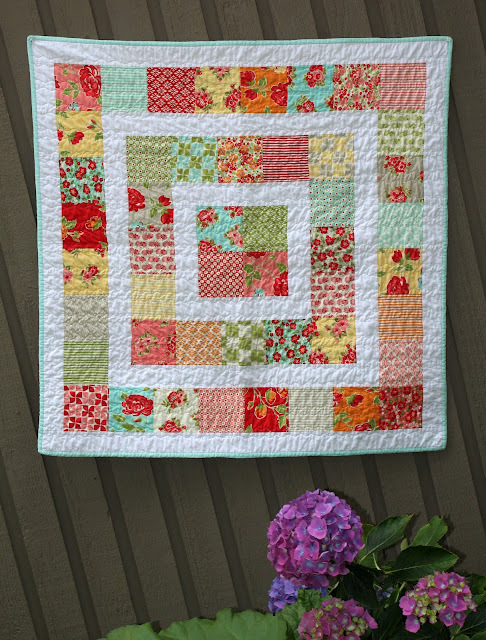 Did you quilt it or did you have it done on a long-arm machine? 3 out of 4, pretty impressive! Fabulous finishes! I think I missed your G.O. Quilt so I'm going to go and read all about it, especially the quilting stuff since I've now got 3 tops basted awaiting my inspiration. I love the fabric you chose to sash those blocks! Very bright and perfect. Your quilt is fantastic. Great choice on the orange! Each block is beautiful. you were almost perfect! better try harder next time! ;) xoxo lovely finishes my friend!